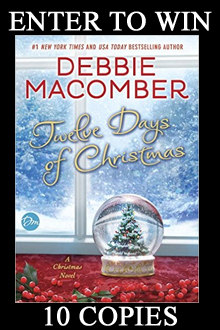 In a festive annual tradition, #1 New York Times bestselling author Debbie Macomber returns with another original holiday novel full of romance and cheer. This time around, a plucky young woman clashes with a real-life Scrooge—her grouchy, arrogant, annoyingly handsome neighbor—and tries to get even the only way she knows how: by killing him with kindness. Debbie Macomber is a #1 New York Times bestselling author and one of today's most popular writers with more than 170 million copies of her books in print worldwide. In her novels, Macomber brings to life compelling relationships that embrace family and enduring friendships, uplifting her readers with stories of connection and hope. Macomber's novels have spent over 750 weeks on the New York Times bestseller list. Eight of these novels hitting the number one spot. In 2015, Macomber's all-new hardcover novels include Last One Home (March), Silver Linings (August) and Dashing Through The Snow (October). Paperback editions will be issued in 2015 for Blossom Street Brides (March) and her Christmas novel, Mr. Miracle (October). In addition to fiction, Macomber has published cookbooks; inspirational and nonfiction works; as well as acclaimed children's books.In addition to fiction Macomber has also published two bestselling cookbooks; numerous inspirational and nonfiction works; and two acclaimed children's books. Macomber's Cedar Cove Series became Hallmark Channel's first dramatic scripted television series, Debbie Macomber's Cedar Cove, now enjoying its third season. In addition, Macomber's upcoming Christmas novel, Dashing Through the Snow, will be adapted as a Hallmark Channel movie in fall 2015. Macomber owns the Victorian Rose Tea Room and A Good Yarn Shop, named after those she featured in her novels. She and her husband, Wayne, serve on the Guideposts National Advisory Cabinet, and she is World Vision's international spokesperson for their Knit for Kids charity initiative. A devoted grandmother, Debbie and her husband Wayne live in Port Orchard, Washington (the town on which her Cedar Cove novels are based) and winter in Florida.